One fact that mystifies many people when they first learn about the nature of ordinary material is that the nucleus of any atom heavier than hydrogen contains both protons and neutrons, but neutrons decay (i.e., disintegrate into other particles) in about 15 minutes, on average! How can carbon and oxygen and nitrogen and silicon nuclei be so stable if the neutrons out of which they are constructed can’t survive on their own? The answer to this question is in the end very simple, once you understand how energy works; it is straightforward bookkeeping. But understanding energy is not entirely simple. You should first read my article about interaction energy and binding energy (which are related, but are not the same thing). Before you do that you may need to read the first parts of my article about energy, momentum and mass. You’ll need to be reasonably clear on these concepts before you’ll understand the answer to this question. What I’m going to do in this article is explain to you why a neutron is stable in the next-simplest of the atomic nuclei: the deuteron, the nucleus of “heavy hydrogen”, also known as “deuterium”. The deuteron consists of just one neutron and one proton — very simple, in principle, not so different from a hydrogen atom with one electron and one proton. Once you understand why a neutron is stable inside a deuteron, you will understand the basic principle by which neutrons can be stable inside of all stable atomic nuclei. The punchline is this: the interaction energy among the protons and neutrons is negative, and of sufficient magnitude that in some nuclei, a neutron decaying would cause the energy of the system (the leftovers from the nucleus after the neutrons’ decay, and any other particles emitted in the decay) necessarily to increase, thus violating the principle of the conservation of energy. Since energy is conserved, that makes the decay impossible. Fig.1: The mass-energy of the neutron (gray) proton (red), electron (blue) and neutrino (black) are shown. 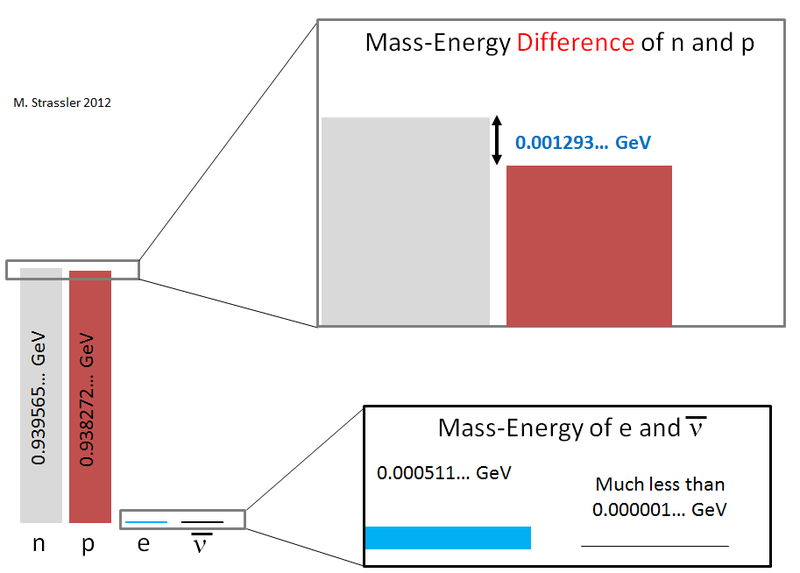 The bars are not to scale but serve to indicate that the anti-neutrino mass-energy is tiny, and the electron mass-energy small, compared to the proton and neutron mass-energies; but the difference in proton and neutron mass-energies is similar to the mass-energy of the electron. Fortunately we won’t need to know about these complications here. All we need to know is that these forces do create a negative interaction energy for the system of the proton, neutron, and the various complicated fields that allow them to interact with each other. And that results in a stable deuteron. Just as a hydrogen atom cannot spontaneously fall apart into an electron and a proton, a deuteron cannot spontaneously fall apart into a neutron and a proton. Fig. 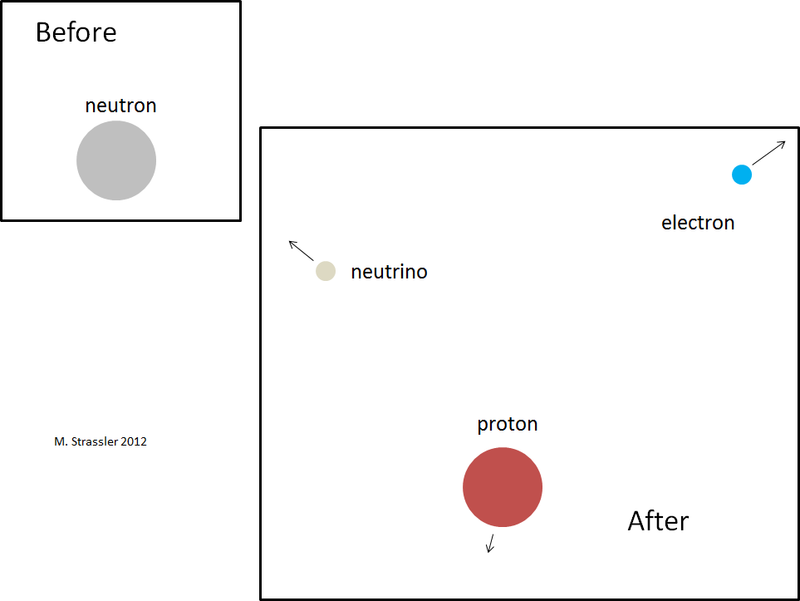 2: A neutron on its own will decay after a few minutes to a proton, and electron and an anti-neutrino (of electron type). The energy bookkeeping is shown in Figure 3. After the neutron decays, what’s the energy of the system now? Well, energy is conserved, and since no energy came in from outside, the energy of the system must still be the same as before : 0.939565 GeV! But how is this energy distributed?! First, there is no interaction energy. This isn’t instantly obvious, but it’s very important. That’s because all of the forces between protons, electrons and anti-neutrinos become very small as these particles move far apart. Second, there is mass-energy for each of the three particles. How much mass-energy is there? the mass-energy of an anti-neutrino is so minuscule that it makes no difference what it is. That’s a good thing, because we don’t yet know the masses of neutrinos — but we do know their mass-energies are much, much smaller than 0.000001 GeV. which is less than the neutron’s mass-energy that we started with, by 0.000782… GeV. So we haven’t seen yet how energy is conserved; the mass-energy of the neutron is not entirely converted into mass-energy of the proton, electron and neutrino. The excess energy is indicated in yellow in Figure 3. Fig. 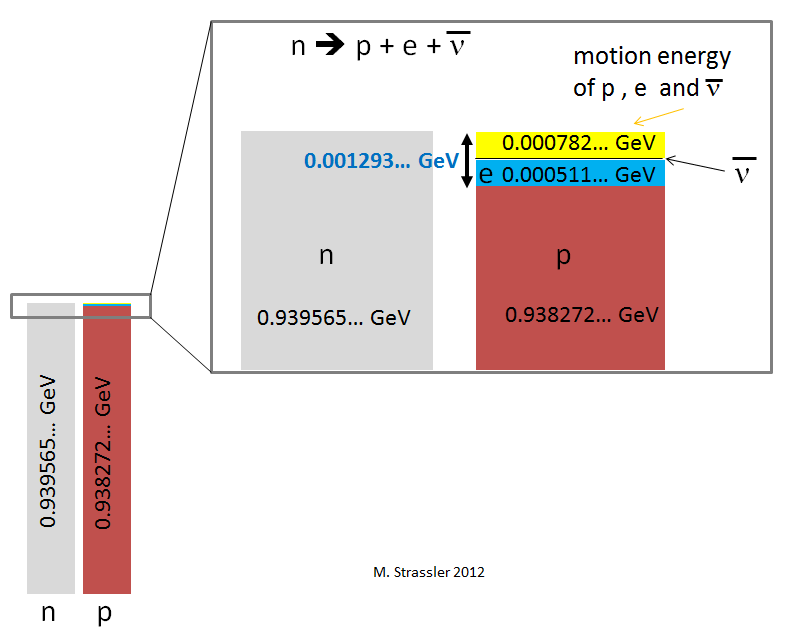 3: A neutron’s mass-energy is slightly larger than the sum of the mass-energies of a proton (red), an electron (blue) and an anti-neutrino (black, but extremely tiny); conservation of energy requires that this excess 0.000782 GeV of energy go somewhere, and it can go into motion-energy (yellow) of the proton, electron and anti-neutrino. We can make up the difference, however, with motion-energy. Motion-energy is always positive. As long as we distribute the excess 0.000782 GeV among the motions of the three particles in a way that preserves momentum conservation (which we can, trust me) then we’re done: energy is conserved, because the mass-energy of the neutron was converted to mass-energy and motion-energy of the proton, electron and neutrino. I haven’t specified the exact amounts of motion energy that go to the proton, the electron and the neutrino separately, because in fact the energy will be distributed differently for each neutron decay, just by random chance (thate’s quantum mechanics for you.) Only the total motion-energy is always the same: 0.000782 GeV. 1.875612… GeV – 1.877837… GeV = -0.002225… GeV. Fig. 4: A deuteron, made from a proton and a neutron bound together by indirect effects of the strong nuclear interaction, cannot spontaneously disintegrate into a proton and a neutron. The energetic bookkeeping which explains why is shown in Figure 5. The fact that there is negative binding energy implies (just as for a hydrogen atom) that the deuteron cannot just fall apart into a neutron and a proton, as shown in Figure 4; this would violate the conservation of energy, which implies that a decaying particle must be more massive than the particles to which it decays. 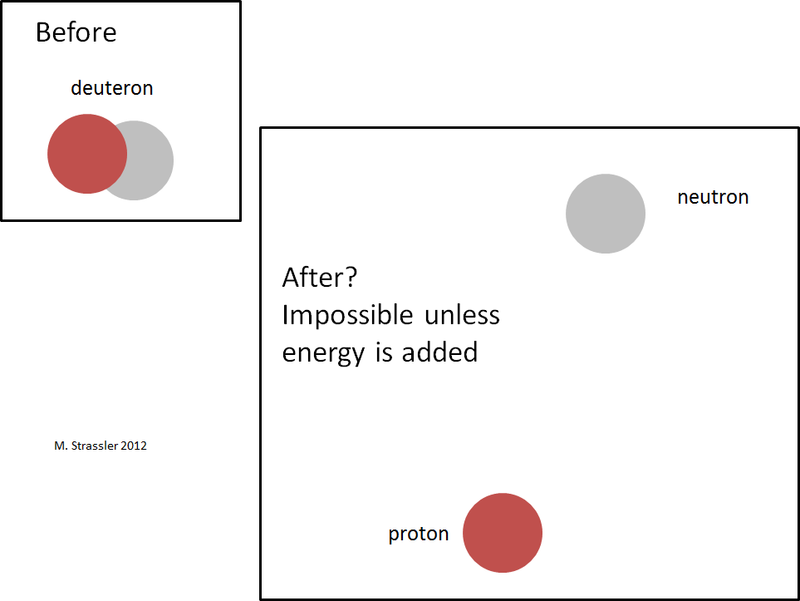 As shown in Figure 5, there’s no way to make energy be conserved; the neutron and proton together have more mass-energy than the deuteron does, and there’s no source of negative energy to cancel off the deficit of energy, since there’s no interaction-energy between a well-separated proton and neutron, and no way for motion-energy to be negative. This means that the process shown in Figure 4 simply cannot occur. Fig. 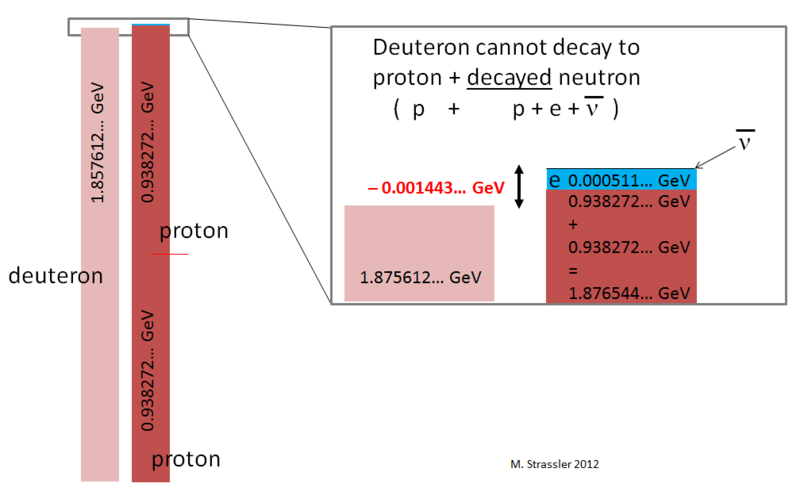 5: The deuteron has a binding energy of negative 0.002225 GeV; that is, its mass is less than the sum of the proton and neutron masses by 0.002225 GeV/c-squared. This means that a deuteron cannot decay into a neutron plus a proton; there would be no way for energy to be conserved. We have one last step to go, and given the steps already taken, it’s an easy one. 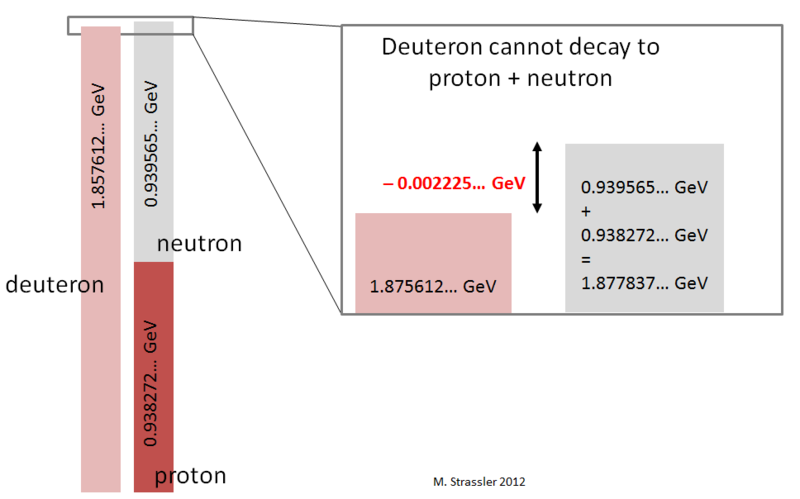 The question is: why can’t the neutron inside the deuteron decay? Suppose it did: what would be left over? 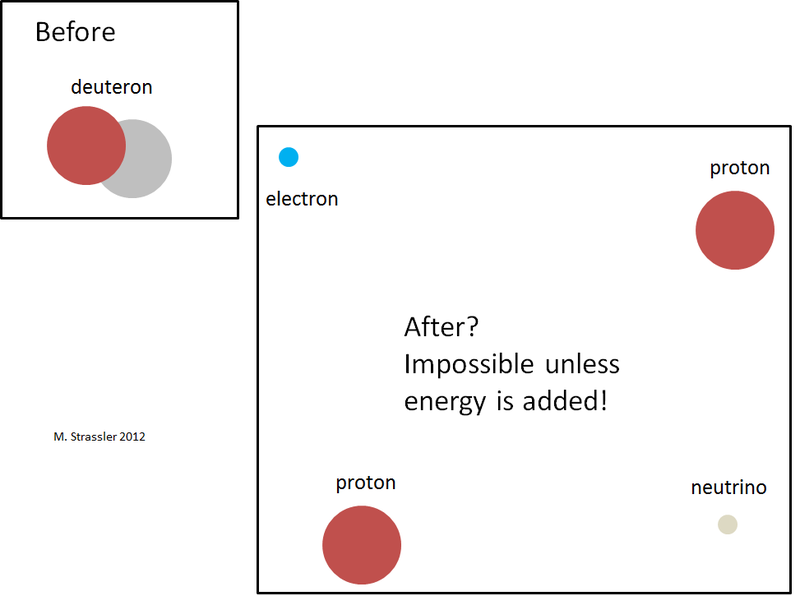 Well, there would now be two protons, an electron and an anti-neutrino; see Figure 6. Two protons repel each other (they both have positive electric charges, so the electric force between them pushes them apart; and the strong nuclear force between them, which tries to pull them together, is not as strong as for a neutron and a proton, the end result being that the sum of the two types of forces is repulsive.) The effect of this repulsive force is to push the two protons far apart. Meanwhile the electron and anti-neutrino would also depart the scene. Fig. 6: One might imagine the neutron inside a deuteron could decay, shattering the deuteron into two protons, and electron and an anti-neutrino. But just as in Figure 4, this would violate the conservation of energy; see Figure 7. With all four particles far from one another (as indicated roughly in Figure 6, but imagine them much further apart than shown), there would be no substantial interaction energy among the particles; the energy of the system would consist only of the sum of the particles’ mass-energies and any motion-energy they might have. Since the motion-energy is always positive, the minimum energy the four particles could have is the sum of their mass-energies. But this energy is larger than the deuteron mass-energy (Figure 7)! Already the mass-energy of two protons, 1.876544… GeV, is larger than the mass-energy of the deuteron; the additional 0.000511 GeV from the electron’s mass-energy just adds unnecessary insult to injury. And therefore the neutron inside the deuteron cannot decay; the interaction energy that helps hold the deuteron together pulls the mass of the deuteron down — down far enough that for the neutron inside a deuteron to decay would violate the conservation of energy! So it is with all the stable nuclei of nature. But you shouldn’t get the idea that it is always true that when you combine neutrons and protons, the result is a stable nucleus! Stable nuclei are actually very rare. Fig. 7: Two protons on their own have a larger mass than the deuteron. The mass-energy of two protons, an electron and a neutrino together exceed the mass-energy of the deuteron by 0.001443 GeV. There is no way, therefore, for the process show in Figure 6 to be consistent with the conservation of energy. What are the nuclei shown in color? It turns out that there are quite a few nuclei that, like a neutron, do fall apart eventually but can survive for quite a while. [We often call these objects “unstable”, though things that are rather long-lived are often called“metastable”; the word-usage is often context-dependent, so you have to pay attention.] The neutron lasts 15 minutes; but there are nuclei that survive for milliseconds, days, decades, millenia, even billions of years. These nuclei are what we call radioactive; they are the dangerous aftermath of radiation accidents or weapons, and the tools used in smoke detectors and in fighting cancer, among other applications. There are a number of different ways that these nuclei can fall apart, but some of them decay by having a neutron convert to a proton inside a nucleus. (We know this because the charge of the nucleus increases, and an electron comes flying out, along with an anti-neutrino.) Others even decay by having a proton convert into a neutron! (We know this because the charge of the nucleus decreases, and a positron [an anti-electron] comes flying out). Figuring out how long a given type of nucleus will survive, and how it will decay, is very complicated nuclear physics — I won’t give you a course in that here (indeed I’m no expert). Fig. 8: The nuclei, as a function of the number of protons Z and the number of neutrons N. Only those shown in black are stable. Those shown in color are unstable. For other choices of N and Z, no nucleus forms at all. Note that for stable nuclei N and Z are similar in size, but the larger they are, the more N exceeds Z. Image taken from http://www.nucleonica.com/wiki . Suffice it to say that negative interaction energy among particles, combined with the conservation of energy, can change the game in a big way, making impossible certain processes that are normally possible — and vice versa. Thanks for the promised dénouement post on why neutrons stay stable in matter. Sometime I think physicists “like to have their cake and eat it too” though. Figure 7 shows we (only) need to find 1443 eV of energy from somewhere to make Figure 6 happen. I suppose that needs the sort of equipment they used to call atom smashers in the early 20th century as it is a lot of energy still (depending on your point of view). Is there never a finite chance of “borrowing” that much energy “from the vacuum” in the crazy quantum world that seems to rule at the atomic level? Certainly we are told there is a finite but vanishingly small chance of all my tea jumping sideways out of my cup or does that not also run to finding a bit of spare energy suddenly appearing from nowhere too? You could borrow that much energy from the vacuum only for a very short time… and then you have to give it back. How short? Turn the 1,443,000 eV (you lost a factor of 1000) into a time using Planck’s constant — it is about 10^-21 seconds. During that time a deuteron could dissociate into two protons, an electron and an anti-neutrino — at rest. Suppose you wanted them to move apart? that would require more energy, and so could be done for less time. During such a short time the neutrino could travel at most a distance of much less than an atomic radius; then it would have to come back. The deuteron would remain intact. ooops! Fig 1 mysteriously appeared…?! This is actually a very good question. To understand how this works one has to understand quantum mechanics more deeply. What’s happening here doesn’t violate causality, but it isn’t obvious why not, given what I’ve told you. What you are really asking is: how does quantum mechanics manage to arrange that energy is coneserved? Let me think about how I can explain this… it should be possible. Just not soon. It would make for a fascinating post–I suspect that a good plurality of the people who express confusion about this issue are bothered by that very question. In a way, a particle obeys quantum mechanics, and quantum mechanics obeys Noether. You could try to explain Noether’s theorem further if you wish to elaborate on the issue. Is this because Quantum Theory contains an element of final cause in that you can only ever calculate the probability of going from initial state to final state. Any attempt to describe intermediate particle locations causes inconsistencies as in the double slit experiment. It actually seems like a non-question-Particles and fields do not “know” what they can and cannot do. It’s like asking how “1” and “1” know to add up to “2”. A decay cannot happen if it is not possible. Our analysis and description of that impossibility is where the seeming problem comes in. There is no difference between normal causality and retrograde causality. Conservation of energy does not care about the direction of time, only that energy is constant. This ‘law’ has no causal power on its own, but only via its effect on the mathematical formulae which actually say how a physical system changes. Moreover, it is a logical truth that if we have “if P, then Q”, that then “if not Q, then not P” is also true. Thus if Y is not hurt, then X is not done. The conservation law states Y is not hurt andquantum physics states what is done. Causality, knowledge, will and sense may have different meanings for a human. But if we express these concepts in an abstract, mathematical manner with leaving the human observer out then they become the same thing: just a relation between things. Do not be confused by the frequent use of ‘an observer’ in the explanations of relativity or quantum physics. Though the theories predict human experience, they describe abstractly the universe. I’m not sure I find this answer entirely satisfactory. Conservation of energy applies locally in space, so it should be possible (given causality) to track it a little more precisely than this. Unfortunately I’m too tired to think straight, so this discussion will have to wait til a later time. While I can get this conservation of energy = stable neuton; what about in high energy situations? For example in the heart of a star there would be no shortage of high energy photons. In this situation would that trigger more neutrons to decay? Yes, in principle, photon + deuteron –> proton + proton + electron + antineutrino is possible, if you have photons around with sufficiently high energy. However, photon + deuteron –> proton + neutron — simple “photo-dissociation” of the deuteron — is vastly more likely. That is because neutron decay is very rare (consider how long its 15 minute lifetime is compared to its natural heartbeat of a billionth of a trillionth of a second.) Photo-dissociation is no more difficult, so to speak, than ionizing an atom; it just requires more energy to do it. You may have noticed I had a italicized paragraph about this in the text, near to Figure 1. Neutron decay requires the action of the weak nuclear force, which in this context really is very weak. What controls the weak field from interacting with the quark field in the neutron and prevents it from transforming B to U since if it did a conservation problem will result ? you said this is a rule , a principle , but i would like to understand the causal mechanism. I’m confused. There isn’t an indepedent b quark in the neutron. Are you think of the Xi_b^0* that I wrote about a week or so ago? I imagine he meant “D to U”. P.S. : Does the fields feel / sense that the neutron mass inside the nucleus is decreased ? Gravitational fields, which do respond to the mass-energy of the nucleus, certainly respond to this effect; otherwise a kilogram of helium would gravitate differently from a kilogram of uranium. That would violate the equivalence principle of general relativity, which is pretty well tested now. No other fields respond directly to the energy of the system, so in a sense they aren’t affected by this. But in a way they are, indirectly, through energy conservation, because certain processes become impossible that would otherwise have been possible. Gravitational fields, which do respond to the mass-energy of the nucleus, certainly “know”; otherwise a kilogram of helium would gravitate differently from a kilogram of uranium. That would violate the equivalence principle of general relativity, which is pretty well tested now. Sorry for the confusion ; i mean D quark not B quark , apologize. Doesn’t a deuteron atom also have an electron, and thus the associated mass and interaction energies ? Are these energies small enough to ignore for the problem being discussed, or did you mean to say “The deuteron nucleus, like a hydrogen nucleus…” ? No, that’s Deuterium. The Deuteron is the nucleus of the Deuterium atom; Deuterium has the electron, the Deuteron does not. I think that there is a special symmetry in the deuteron, containing 3 up and 3 down quarks. The largest stabile nucleons also maintain this symmetry. 1) There is an approximate symmetry in which we exchange all up quarks with down quarks and vice versa. This is called “(strong) isospin”. [“Weak isospin” is related but different.] This symmetry does exchange protons with neutrons. 2) The deuteron is indeed symmetric under this symmetry. 3) However — as I emphasized elsewhere, it isn’t really true that a proton contains just three quarks, and similarly a deuteron doesn’t just contain six quarks. See https://profmattstrassler.com/articles-and-posts/largehadroncolliderfaq/whats-a-proton-anyway/ . 5) However, for larger nuclei this symmetry is not true. That is because of electromagnetism. Electromagnetism gives up quarks charge 2/3 and down quarks charge minus 1/3, and thus electromagnetism breaks the strong isospin symmetry. Therefore, for nuclei with large charge, we should not expect them to be symmetric under the exchange of protons with neutrons. 6) For large nuclei, with large electric charge, the breaking of weak isospin by electromagnetism implies that stable nuclei do not have equal numbers of protons and neutrons; the number of neutrons is increased relative to the number of protons in the heavier stable nuclei, such as gold, with 79 protons and 118 neutrons. See Figure 8 of this article. I thought about the 3 up and 3 down quarks aligned in the 3 geometrical coordinates of the space ( 3 color charges), as 2 dimensional membrane (+2/3 electric charged up quark) and 1 dimensional string (-1/3 electric charged down quark) giving a complete symmetry, if we order 1/3 electric charge to each geometric dimension. Sorry, I’m revising my comment because now I think I understand what you were trying to do. The problem with this is that up and down quarks are the SAME in color-space, just different in charge. So to represent one as a string and the other as membranes doesn’t work. You won’t get the correct symmetries. For example, if I imagine turning off electromagnetism (by turning down the strength of the force, leaving the charges still 2/3 and -1/3) and making the up and down quark masses equal, the proton and neutron should be isomorphic and therefore have the same mass. But you have a proton as having two membranes and a string, and a neutron as having two strings and a membrane… in other words, your model breaks the very symmetry that you’re trying to obtain. See my revised comment above. I don’t permit advertising of speculative ideas on this website, especially if they are inconsistent with data, sorry. p.s. why are you trying to solve an already solved problem? Numerical results show the existing theory of quarks and gluons known as “QCD” correctly predicts the properties of the hadrons. See for example figure 17 and figure 20 in http://arxiv.org/pdf/1203.4789v2.pdf . Many thanks for the link, where I fund also many published work of my classmate Peter Hasenfratz. However this ‘strong isospin’ idea is new to me, do nuclei with equal numbers of protons and neutrons have an extra stability due to this symmetry? Is the stability of lithium-6 compared with helium-6 due in part of mostly to one nucleus having equal numbers of protons and neutrons and the other not? P.S. ‘thate’s quantum mechanics’ is a spelling mistake. This is off topic, but will you have any comments regarding the paper by Pusey, Barrett, and Rudolph that appears to be causing such a fuss? I’ve been trying to understand the arguments, but it is not easy for a non-expert. There are two different questions. 1) Why is the value of the Higgs field (which sets the scale of 246 GeV of the weak nuclear force and the overall scale of the W, Z, quark, lepton and neutrino masses) so small but also not zero? — that is the hierarchy problem, which you can read about on this site. https://profmattstrassler.com/articles-and-posts/particle-physics-basics/the-hierarchy-problem/ If the Higgs field were zero, all these particles would be massless (the proton and neutron would remain massive but much lighter — and the proton would be heavier than the neutron — sorry, I still have to explain to you where the proton mass comes from); and if the Higgs field value were huge, then all the particle masses (and the mass of the neutron and proton) would be huge. The world would be completely different in either case, so different that it is almost pointless to worry about the stability of the neutron; there’d be no atoms if the Higgs field were zero and atoms wouldn’t be recognizable if the Higgs field were huge. 2) Why, given that the Higgs field has a value of 246 GeV in our universe (or at least in the part that we can observe), why do the various quark and lepton masses take the values that they do? Why is the top quark over 300,000 times heavier than the electron? Why is the muon about 200 times heavier than the electron? Etc. This doesn’t have to do with the value of the Higgs field but rather with the strength with which the Higgs field interacts with all the other fields and their particles. If you changed the masses by small amounts you could make the neutron stable or make it decay much more easily, destabilizing many of the currently stable nuclei. We don’t know the answer to either question. As far as we know these questions may have completely unrelated answers. If there is a Higgs field and a Higgs boson (or 4 minus 2 🙂 ) doesn’t that mean there is a Higgs force? I guess what I mean is, would a fundamental theory (say string theory) have to unify the 4 basic forces plus the Higgs force? Or is it somehow special? As an aside – this site is wonderful. In the 1980s the point that this should be mentioned when discussing physics with the public was always emphasized by the great theoretical physicist Bjorken (who arguably deserved a Nobel Prize for showing how to measure whether protons had small particles inside them; his work led others to get a Nobel for finding quarks in the proton). Unfortunately Bjorken’s articles are not easily available, but if you Google “Bjorken fifth force” and click on the Google Books link, you can read the opening pages. I heard Bjorken (who was a professor at Stanford’s Linear Accelerator Center, where I was a graduate student) talk about this a couple of times. The Higgs force doesn’t have to be directly unified with the others because it has a different origin; that’s a very long story. In something like string theory or other attempts at quantum gravity, it would probably be unified with the others only after accounting for some additional effects about which we don’t know, such as the geometry of extra dimensions that haven’t yet been discovered, or the presence of additional effects from heavy particles and fields that we haven’t yet observed. Could I ask you to elaborate on how a non-zero Higgs field contributes to hadronic masses beyond the relatively small mass of the valence quarks? You mention the possibility of a variable higgs field. My understanding was that we had a hard time determining the value of the higgs field, therefore how certain are we of its value across the observed universe? Stupid question I grant you, but would that affect some of the calculations for missing mass in the dark matter puzzle? We actually know a lot. Even if you don’t know the value of the Higgs field (or fields), you know that the masses of quarks and leptons are proportional to it (or them). Even a very small change in the value of the (or a) Higgs field would shift the electron mass and the proton mass, and generate effects on the spectral lines of hydrogen. We can see light being emitted and absorbed by hydrogen across huge swaths of the universe. Gas in intergalactic space generates the “Lyman-alpha forest” of spectral lines (See for example http://astro.berkeley.edu/~jcohn/lya.html ) — these also show that spectral lines of hydrogen are the same in intergalactic space as they are inside of galaxies. Let’s put it this way: if anybody noticed spectral lines out of place, they’d win a Nobel Prize. Certainly people have looked for this possibility. Every now and then someone claims to see something amiss, but nothing has ever been convincingly confirmed. So I’m afraid that within the visible part of the universe, all the laws of nature and values of fields appear to be constant in space and in time, to a very high degree. Of course we’ll keep looking for subtle effects, but there can’t be anything too dramatic. Okay I didn’t realise the emission properties of an electron was determined by its mass, or at least the part of its mass that was due to its interaction with the higgs field. If I understand correctly what is meant by mass in this context it is the base energy a particle can have. The rest mass. A weaker or stronger higgs field would mean that an electron would still exist but it would consist of less or more energy respectively. In your article on what particles would be like with a zero higgs field then that still implies the electron would have some energy, but it wouldn’t be mass? In a zero higgs field could you still talk about rest mass (or rest energy of a particle in this case) or would you just have the pv component? So given the coincidence of the relationship between the higgs field and gravity I have to ponder what is mass if not the rest mass of the particle or its gravitational component. This just leaves the effect of inertia but that’s not what I’d got from the articles I’d read so far; is that also part of the story? Is it that it is inertia that comes from the interaction with the higgs field (that is particles that don’t interact with the higgs field have no inertia so travel at the speed of light). It is easy to get confused. Yes, on this website the word “mass” (as in all of particle physics today) always means “rest mass”. Energy is equal to mass times c-squared for a particle at rest; if the particle is moving, its energy is larger. All of the mass of an electron comes from the Higgs field. [Read: “its rest mass comes entirely from the Higgs field.”] All electrons have exactly the same mass. They can have any energy, small or large, as long as the energy is larger than the electron mass times c-squared. The emission properties of an electron do not depend on its mass. But the probability that an emission occurs, and therefore the rate for a decay for a particle like a neutron, depends on how much energy is available for the decay to occur — the yellow band in Figure 3. If you increase the electron mass, the band shrinks and the decay process becomes slower. “A weaker or stronger higgs field would mean that an electron would still exist but it would consist of less or more energy respectively.” Less or more energy when it is at rest, yes. So what happens for a massless electron? It’s energy at rest would be zero. But if it is massless, it moves at the speed of light, and (like photons) is never at rest. So the question never arises. If the Higgs field were zero, various particles of nature would become massless. That means they would travel with the speed of light… and, like photons, could never be at rest. And like photons, they could have any energy, small or large — all while remaining massless. Figure 8 really shows how few elements are stable. Would this be an argument for fine tuning? I am thinking about the theories where there may be many universes or separate parts of this universe with different physical constants. If there were slightly different constants, would that mean there would be no stable nuclei, or is there some other reason that there are so few stable nuclei? The problem is not that this is implausible. The problem is that many things are plausible and few are true; so how do we test this idea? We need to actually (a) understand that the universe is much bigger than the part that we can see, and (b) understand how physical constants can change, and which ones are correlated with other ones. Unfortunately no one has suggested something realistic for (a), and (b) will involve developing particle physics and cosmology to the point that we can understand better where the physical “constants” come from. Well in response to a) the size of the universe, the one thing that blew my mind was the comment that the universe appears homogonous in all directions. Therefore we are either at the centre of the observable universe, or _far_ more likely the universe is _many_ orders of magnitude larger than the observable universe. Quite probably as many times larger as the observable universe is from our planet or from an atom. Given that with a universe of that size the anthropic principle for me tends to a certainty and arguments about fine tuning fall apart. I don’t see why knowing the universe is enormous tells you one way or another whether it is uniform or non-uniform beyond the region you can see. If you were on the ocean, but figured out that the earth was many times larger than the part of the ocean you can see, would you conclude the ocean covers the whole earth, or would you conclude that the earth is probably very heterogeneous and that most of the earth is not-ocean? Whichever one you concluded, you’d be wrong. We simply don’t know. Now since this very nice conversation pulling us to meaning questions , allow me to ask you a personal one ; from your perspective what is the meaning of life , what is your primary objective in life beside being happy and successful of course , am i crossing a line ? but we need humane aspects in our relation as humans. In my previous reply to a question from you above, I tried to encourage you to let loose the humane aspect of your being when you try to understand the (physical) world. Perhaps in understanding the world better you can better answer questions regarding man, as man is part of the world, but perhaps not. It is sure however that the universe works the same regardless of our existence and is an interesting topic. So pull away. Is the 246GeV of the higgs field a measured value or a deduced one from other constants + the overall equilibrium of the mathematical structure ? Measured/deduced. It has been measured since the 30s (even before we knew about Higgs fields); it determines the strength of the weak interactions, through what is known as Fermi’s constant. But to relate Fermi’s constant to the Higgs field’s value requires a small bit of deduction — which has basically been validated by measurements of the detailed properties of the W and Z particles and the top quark. Even more precisely: if there are several Higgs fields, what we know is that the sum of the squares of the Higgs fields’ values is (246 GeV)^2. This was not detailed previously , so would you please explain the connection of weak interactions-fermi,s constant and higgs field……as far as i remember this topic was not elaborated before. the Higgs field gives the W particle its mass: mW = gW v, where gW is the strength of the weak nuclear interaction when a W is emitted, and v is the value of the Higgs field. Fermi’s constant is just 1/v^2 up to some factors of 2. So it was known early in the history of the weak interactions. But it wasn’t until the 1960s, when the Higgs field idea was introduced, that one realized that the right way to think about Fermi’s constant was as 1/(Higgs field value)^2. Off topic, but a couple of questions have me curious… What is so special about square numbers and their frequent appearances in physics equations and constants? Is the some underlying geometry that makes them favorable? Also, are fields (Higgs, etc) necessarily three-dimensional (instead of, say, two) or does this question not make sense with respect to fields? It’s basically that (a) the universe is, at least temporarily, stable, and (b) just like a marble at the bottom of a bowl, or a swinging pendulum, if something moves or changes by a small deviation away from a stable place, it will generically have an energy that goes like the small deviation squared, plus more complicated but smaller corrections. That’s because the energy must increase in all directions for a deviation (positive or negative) from a stable place (since decreasing energy for any small deviation would mean instability) and the simplest thing that increases with the deviation and is smooth everywhere is (deviation)^2. Fields that fill the universe are obviously three-spatial/one-time dimensional. But you can think about the height of the ocean above sea level as a two-dimensional field; the deviation of a guitar string from a line as a one-dimensional field; and the vibrations of a particular atom around a point in a crystal as a zero-dimensional field. What are you really asking? To complete the electro-weak theory it was AGREED UPON to call v as the new concept which is the higgs field while no experimental independent measurement for it exists , it is purely a concept for a measured quantity — v— which just called H.F. i mean it is indirect deduction that we assume may exist to complete the W- , W+ , Z picture. P.S. : the deduction part is calling the measured v as H.F. , but a deduction could be false if other possibilities exist. I probably should have written measured/deduced/confirmed. When the 60s came along it was *proposed* that Fermi’s constant should be thought of as 1/v^2. But the theory that suggested this (which we now call the “electroweak theory” — it was developed gradually, not all at once, but its structure was entirely clear by the mid 70s) had many experimental consequences. Over the ensuing 40 years or so those consequences were confirmed one after another — hundreds of them, by now — so it is no longer debated in the community whether this was a wise proposal. Notice, however, that just because we know there is a thing called “v” (from one or more Higgs fields) does not mean that we know anything more about the Higgs field (or fields) than that it exists (or they exist.) We don’t know if the Higgs field is an elementary field or something more complicated. And we don’t yet know whether there is a Higgs particle or not; see https://profmattstrassler.com/articles-and-posts/the-higgs-particle/360-2/ . The Large Hadron Collider was built to clarify this situation; find the Higgs particle (or new particles and forces that take its place), and figure out what the properties of the Higgs field (or fields) is. Great article though! Thanks for providing understanding in physics for the masses. 1- We have a proven description of the electro-weak interactions thru proven force carriers , W and Z in particular…..
3- We know thru deductions some properties of that ingredients…..
4- We called the above mentioned : the higgs field or fields and the 0-spin higgs boson. 5- This is all the knowledge we have as per now. thanks for your kindness . Its a kind of mag.9 earthquake when one enters the realm of particle physics articles !! i just read number of articles claiming that higgs phenomena is a huge fudge factor INVENTED to save the S.M. , same as the famous fudge factor of cosmological constant inserted in G.R. until the cosmos proved it wrong leaving it as the biggest blunder of a great mind ……..
Now what shall we believe ??? to be …or…not to be ? The cosmological constant wasn’t a blunder. Einstein put it in there because he believe the universe behaved a certain way. When that was proved wrong, he called it a blunder. But later on, it was found to be useful given more observations. Just because someone abandons an idea doesn’t mean it isn’t useful later on. As in all things — you must be a cautious reader. Do not overinterpret everything you read; on the internet, you can find any opinion that you want, and also the opposite opinion. You must use your head. I do not ask you to assume this website is correct on all things. But I do have a firm commitment to represent what I believe is the mainstream scientific viewpoint of the experts in my field… and as an expert, I know that I can do that accurately most of the time. And keep in mind what my record was with the OPERA experiment. Did I lead you wrong? Though I do not know what articles you read, I don’t see how one can really argue that the Higgs phenomenon is a huge fudge factor invented to save the Standard Model. Remember the Standard Model isn’t just a random theory. It successfully predicts hundreds of measurements that have been made at the Large Hadron Collider, and at thousands of measurements made at other colliders. It’s not something we humans need to save; nature already saved it. Also, do keep in mind that last week I pointed you to a panel of 6 of the world’s experts on the Standard Model and the Large Hadron Collider — all of them professors at major universities — and not one of them took this point of view. Now you can always argue that all the experts are wrong, and occasionally, of course, they all are. But although a failure of a mainstream view becomes justifiably very famous, one should remember that most of the time a mainstream view turns out to be correct. The mainstream view on the OPERA experiment, from the beginning, was that they must have made an error. And that was true. Very good article. If we put the deuteron nucleus in a magnetic field and just rotated it enough to give the particle more than 0.002225+ GeV of rotational kinetic energy, would it fly apart? We , the common , do not have the ability to judge so confusion is a fact of life for us. I see the size of deuteron is just over 2 fm ( if charge radius is essentially the same as size ) and that the proton and neutro are just under 1 fm in size. What prevents the neutron and proton coalescing into one blob of six quarks. Is it just quantum uncertainty that pushes them apart into a lower energy configuration of a distinct neutron and proton? In the article were you alluding to a colour van-der-waal like interaction between proton and neutron. Matt: this is all great stuff. Thanks! Would you please recommend an in-depth book on nuclear physics? I am a mathematician by trade, so the theoretical level is no problem. I’m familiar with Griffths’ excellent “Introduction to Elementary Particles”. For what it’s worth I think that conservation energy is no more than our seemingly foolproof book keeping system rather than some magic mechanism of nature. I’m not sure of the difference, however. 1- LHC must have been designed to investigate other possibilities , then why all talks are around the higgs only ? why the public is directed only towards the higgs ? 2-Is this site concerned only with the higgs ? is it time to start explaining other models in case you find it appropriate ? 3- You said in your FAQ article that we need to know the particle so we know the field , but if no particle then how can we be sure that other model is not in charge ? In your a/m article you said that you are absolutely completely 100% sure that higgs field exist , well , this i understand as stating that any UNKNOWN FIELD the LHC may discover you just call it higgs as a mere definition …..or else ???? Matt, you said the neutron cant decay inside the deuteron because the 2 proton masses are bigger than the deuteron mass. But a proton + neutron also has more mass than the deuteron. I guess I didnt understand why it cant decay, since the binding energy could solve the conservation problem. Is it because there would need an electron, which is massive and thus requires energy? If yes, then I have another question: If electrons’ mass were zero (or very lightweight), then the deuteron would decay? Clearing the question: p + p masses sould be less than p + n masses, dont it? If I understand correctly, the explanation is that the p+n system has a negative interaction energy, but the p+p system has a positive one (and this energy would be converted to kinetic energy: the protons repel). And even though the proton has a lower rest mass than the neutron, the difference in these masses is less than the difference in interaction energy between the two systems. Matt cleverly avoided having to calculate the interaction energy of the p+p system , by noting that whatever it is, it’s positive (he referred to it as “the motion-energy of the protons after a long time passes”, because energy is conserved when time passes), and we already explained that the rest mass difference isn’t big enough to overcome just the difference going from the negative interaction energy of the p+n state and a zero interaction energy state — let alone a positive one. I igree. But due to charge conservation, all the positive potencial energy the p+p system should cancel the p+e negative energy, dont it? Is the difference in mass energy between a neutron and a proton due mostly to differences in the strong nuclear force, electric force, magnetic force or a difference in the rest mass of the up and down quarks? Now you said that the technicolor huge force COMPELS the techniquark and its anti fields to form a composite field which is the HIGGS FIELD , but sir ; physically COMPEL means a directing mechanism , so it is not only the T.C.F but a stronger force must exist to enable the T.C.F to implement its effect……..
Are we here on the verge of infinite regression ????? p.s. : the a/m is in case of no higgs particle. “Compel” is not really a good word; it implies agency that the physical objects don’t have. What actually happens is that one writes the technicolor equations, and solves them in order to make a prediction as to what will occur. There’s no clear cause; there is simply effect. In a similar way, I could say that the electromagnetic force “compels” the electron to orbit a proton in a hydrogen atom; but that’s a figure of speech. What actually happens is that if you put an electron near a proton in a world where the two are subject to electromagnetic forces, they will form a hydrogen atom (emitting a photon or two in the process.) What caused the hydrogen atom to form? Looked at carefully, the question is not answered by the equations. So am i allowed to understand that the mathematical structure of physics of ontology is not capable of giving causes , only effects , then we are forever in lack of final explanations ? You said : ( there is no clear cause …….) so the burden is on your side . My understanding of cause is exactly the concept of what you called (COMPEL ) , i mean the existence of some power that DIRECT all the realm of fields , particles , forces to “” behave “” in the way we observe . As you said , equations does not give explanations of why effect X exist — so that kind of understanding is an obligatory one. I thought “what” and “how” were the purview of science (eg Physics), whereas “why” was in the realm of Metaphysics (eg, Religion). But even in science you cannot escape the ultimate questions or else the scientist is a mere computing machine but he is not , he is human , asking , wondering , reflecting …..what you call ( metaP /religion ) is he most high faculty of being human…….pick your choice . Remember that even the atheist s.hawking wondered : what breathe fire in the equations ? Equations are descriptions , what transforms it to actuality ? When physics exhausts all its powers of description , the datum must be shifted to the metaphysics or else the whole enterprise would be just a kind of prejudice and arrogance. Did you ever reflect that without grasping and reflecting upon the why questions , ie. the meaning , all of our life would be mere VANITAS VANITATUM ? There’s no problem asking “why” – it’s the expectation that you will find the “answer” that is the hedgehog. It depends where do you seek . One question about the neutron decay. When free neutron disintegrates to proton, electron and neutrino, what “force” gives the kinetic energy to these particles? Do we know in more detail what happens in the “explosion”? It’s really not an explosion, but simply a transition among waves, and no additional forces are needed. And the energy needed to give those particles a kick is already stored in the neutron. X is a “particle”, but what that really means is that it is a quantum: a ripple in the X field with smallest possible amplitude. And since it is a ripple — a wave — that means that it is vibrating. Vibrations have associated energy. In other words, X has stored energy just because of its own existence. If X is standing still (relative to us) that energy is simply related to its mass, by E = m c-squared. Now here is the main point. It is possible for the X field and the Y field to interact with each other. So — what happens to the X particle, the vibrating ripple in the X field? Because the X field interacts with the Y field, the vibrations in the X field can set up vibrations in the Y field. If we were living in a classical world, the result would be similar to what happens in the violin — energy would be gradually transferred from the X field’s vibrations to vibrations in the Y field. But in our quantum world, because the X particle is a ripple in the X field of smallest possible amplitude, it can’t gradually become smaller. It just suddenly disappears, and its energy may be transferred entirely and suddenly to the Y field. Most often, that energy transfer is in the form of two ripples in the Y field — i.e., two Y particles — which carry the energy that used to be stored in the X particle off through their motion in opposite directions. So it’s not really an explosion — like a chemical detonation of a bomb. It is a quantum (and therefore sudden and discrete) version of what would be, without quantum mechanics, a smooth and continuous transition. Thanks for the clear explanation! I think I got the main idea. One question about the time scale of the decay process. When you say “suddenly” does this refer something which is happening in duration of Planck’s time i.e. is the decay “instant” in that sense? Indeed, by sudden I don’t mean instantaneous. The shortest possible time over which a decay could occur would be about the same as the vibrational period of the X particle; heavier particles vibrate faster. (I often poetically call this the “heartbeat” of a particle; see https://profmattstrassler.com/articles-and-posts/the-higgs-particle/the-standard-model-higgs/lightweight-higgs-a-sensitive-creature/.) This is often much, much shorter than the average lifetime of the X particle. Now this means that ANY ripple which must have vibrations then must have E then must have m then all particles must have mass…. there is something wrong here…….WHAT ?? Yes, one has to read the logic carefully. E = m c-squared only if the ripple is ‘at rest’ — if its crests and troughs are not moving through space. If it is moving then E is greater than m c-squared. If it is massless it is always moving and can have any E.
Even the photon according to this logic must have mass since it is a ripple since it is vibrating while the moving of the ripple is not related to its intrinsic vibration energy ……….or what !? A photon in vacuum is always moving through space; the ripple is never at rest. There is no contradiction in the logic. Sorry matt. but i am not satisfied with the answer , crests and troughs are never at rest , there are always vibrations , and you said that THESE vibrations are energy whether the ripple is moving or at rest , the system itself is pulsating and these ” pulsations” are energy and these energies are mc^2 even if it is at rest ………vibration E leads to m……there are always vibrations independent of motion so there are always m no matter the ripple is moving or at rest. Here is an vibrating number: it is 3, now it is 4, now it is 3, now it is 2, now it is 3, now it is 4, now it is 3, now it is 2. Its VALUE is moving — vibrating — oscillating with time. But this change in its value has nothing to do with something moving in space. When fields vibrate, their VALUES are changing with time. The crests are high field values, their troughs are low field values. The oscillations themselves do not involve things MOVING IN SPACE. So you are confusing yourself by thinking of field waves as something like waves on a pond. Yes, for waves on a pond the surface of the pond goes up and down, up and down, IN SPACE. Not so for the Higgs field when there is a Higgs particle at rest. Yes, the Higgs field is oscillating — its value is vibrating, changing all the time — but it is not going up and down, or right or left, or front or back. Nothing is moving in space at all. The Higgs particle is at rest. Forgive me for interjecting here, but you seem so keenly interested in this subject and ask so many questions, that I can’t help wondering if it might be worthwhile for you to try and actually learn this stuff properly, rather than by squeezing out understanding question by question from Matt. You’re clearly very eager to learn and understand this, but you show some basic confusion about the nature of this subject, and I worry that this process risks compounding certain misapprehensions (because the task of simplifying such a complex subject will inevitably leave some proper grounding out – although I do think Matt does a fantastic job of translating quantum field theory into something understandable to the lay person). Really learning this stuff properly takes years, but it’s worth it if you really want to understand how the universe works at its most basic level (and there’s no shortage of material on the web and in bookshops for introductory quantum theory and relativity). I am spending huge effort to understand the most fundamental level of existence , i am very sorry for any disturbance , but this particular point is very vague ……. i understood from many articles and from this site that ripples are waves , true waves as in a pond , even all diagrams of professor mat. are showing waving in space…..
Well , if waving is not in space , if a ripple is for ex. 2-5-1-7-3-2-8 field values , then numbers must refer to something , then if this series is for photon in EMF. then what dictate this particular series trillions upon trillions of time ? In addition Matt. said ( vibrations have associated energy ) , does this apply to number series ? what is the meaning of smallest amplitude ? are not amplitudes in spatial waves only ? This side is an educational one for lay persons , i am such one , i am not expert , it is very hard to find answers for fundamental questions outside this great website . A wave doesn’t have to move through space. There are such things as standing waves. has some good examples. In a standing wave, the values can fluctuate, but don’t move anywhere. And from some of the other articles, it sounds like three-dimensional waves behave differently from two-dimensional waves (like on a pond), so be cautious about using a pond analogy. And I don’t think those number have to refer real particles, it is just a fluctuation in the strength of a quantum field. It is what is sometimes called ‘virtual particles’. My link was cut out so wikipedia has some examples in the ‘Standing wave’ article. Several of your statements are misleading, or even incorrect. I am too busy to fix them now but will do so later. The three-dimensional wave is also not by itself the answer; you can have three dimensional waves in which things move. That’s just not the case for fields, out of which all things are built. There is no real connection between this discussion and virtual particles. Let’s not put these different issues on top of each other and make the confusions worse. A bit more precisely: a modern particle-physics “theory” consists [simplifying slightly] of writing down a function (called a Lagrangian or Hamiltonian) of the fields, and from this function all the rules can be derived and the energy computed. But why these fields and not others? We don’t know. Why these rules and not others? It turns out that nature obeys some of the simplest possible rules *given* that we have the fields of nature that we observe, and the space/time we observe. So maybe there is a sort of simplicity argument. But you have to take the fields, and space/time, for granted in order to make that argument. I was mis-guided and mis-informed by tens of articles explaining the field as the surface of the ocean with waves moving on it , now i understand the field in analogy to the 3D atmosphere where pulsations of barometric pressure happening all the time without any movements whatsoever. I would like to blame some one but who is to be blamed ? My appology Matt. for wasting your time and effort thru a wrong path from my side. No apology needed. It’s confusing. WE are the ones to be careful , you are the ones to be appreciated. On the contrary; teaching requires extreme care with the use of language, and your feedback, via your confusions, is very instructive. I am a physics amateur and am wondering why matter is just made out of lightest leptons (e) and baryons (p and n) and not of a cloud of muons for example and a nuclei of mesons or heavy baryons? Someone will stipulate that weak force will decay this kind of matter, but an assortment of the four interaction may bind them together!? Surely, this is a kind of Fermat’s principal where nature is looking evrytime for simplist (in fact the perfect) configurations! The answer to your question is one of detail. In principle there could be forces strong enough to bind things together so deeply that bound clouds of muons could exist, or mesonic nuclei. It simply happens that the forces are not strong enough, and the particles to which these mythical objects could decay are light enough, that nothing can prevent the muons and the mesons and the heavy baryons from decaying. The possibility that clumps of Lambda baryons could form large chunks of stable matter has been considered actively over the years: the term “strangelets” is often used. There’s still no clear evidence against the idea, though also no evidence for it — whether these things exist is a quantitative question whose answer is very difficult to calculate. Perhaps someone can point me to an article that explains what provides the repulsive force that balance the strong force that attracts neutrons together. This force must be similar to the electric force in magnitude otherwise neutrons would be found at a different radii than protons. I know this sounds horribly ignorant, but I haven’t found anything about a counterbalancing force between neutrons except the degenerate force. Thank you so much! I am studying Physical science and they just briefly mentioned the fact that a neutron can “fall apart” into a proton, electron and an antineutrino and I could not find how or why anywhere. Thanks you for clearing that up, as well as give a wonderful presentation of neutron’s stability! sir u are my friend,philoshpher and guide::::you are great sir that even with ur busy schedule u are helping the beginners problems with great and interesting explanations, i pay regards to ur works, a whole hearted thnxxx to u for ur kind help u r providing. Thinking of neutrons in the context of the quark model leads to the question wether it might be possible that a nucleus contains anti-neutrons as well, or even anti-neutrons only. Are there any experimental facts which ensure that a nucleus contains neutrons but no anti-neutrons? Yes. Antineutrons would annihilate instantly with the neutrons or protons in the nucleus; the quarks in the protons and/or neutrons would quickly find the anti-quarks in the anti-neutrons, and *BANG* — there goes the nucleus. That particle + anti-particle decays into 2 photons or something else under ALL circumstances, even inside a nucleus, is just an assumption, but not a physical fact ! If there are ONLY anti-neutrons ‘inside’ the nucleus then such an annihilation can not happen, there is nothing which will initialize the *BANG* of the nucleus. If one considers an anti-neutron as a ‘bound object’ consisting out of anti-proton + positron + neutrino then the nucleus is a kind of ‘protonium’ which can be assumed to be stable because of the presence of the positrons. There is a ‘little’ particle model ( ‘hypotron theory’ , still under construction , c.f. http://www.kreuzer-dsr.de ) beyond the standard model which predicts for nuclei consisting out of protons and ANTI-neutrons the “valley” of stable nuclei by means of a minimum principle for the so-called “supercharge” ( which is not an additive quantity ) AND which can explain why neutrinos, electrons, protons and two other ( ‘dark’ ? ) sorts of particles with charge 2 and 3 are the only sorts of stable particles that can exist. Na-24 has a halflife of 14,96 h, Na-25 has as halflife of 59,1 s. Both decay via beta-minus, n -> p + e + v.
Can you explain why this decay happens faster for Na-25 than for Na-24? There are fluctuations that cause the decay, and these fluctuations are more probably to happen for Na-25 than for Na-24. Is this idea right? If so, what are these fluctuations? I’m trying to explain it in a simple way to my students. Thanks. This may be more of a philosophical/semantic issue than an actual physical one, but let me raise it anyway, as it has concerned me for some time. The deuteron with GeV of 1.875612 being less than the sum of its parts (proton + neutron) = GeV of 1.8777837, in what real sense can we maintain that the deutron is actually made up of these two particles? Could we not interpret the experiments so, that by adding energy to a deuteron we can induce it to decay into a proton and a neutron, whereupon the neutron will spontaneously decay, this time without any further energy added, into a proton, an electron and an anti-neutrino? As far as I know, no one postulates there to be a proton, an electron and an anti-neutrino within the neutron — these are considered to be the decay products of the neutron, formed at the moment of its decay. Then why are not the proton and the neutron similarly considered to be the decay products of a deuteron, formed at the moment of its disintegration? I understand the difference that in the one case the process is a spontaneous one due to the excess energy of the neutron with respect to its decay products, whereas the decay of the deuteron must be induced by the addition of energy from an outside source. What I am driving at may be merely a semantic issue, still it would interest me to know why we think of the proton and neutron as existing as identifiable particles within the deuteron, but do not consider the the proton, electron and anti-neutrino as existing as such with the neutron (prior to its decay). I agree : it is too complicated to be true and i think nature is simpler. I do not understand why in unstable nuclei al nucleons transformations are possible while in the so called ‘STABLE’ ones are blocked. I do have a question for you: The hydrogen was the first element created after the big bang. It is safe to say that the Hydrogen we have in us is 13.7 billion years old? It is possible for an atom of Hydrogen to be stable for such a long time? Forget for a moment the hypothesis of the big bang. Hydrogen is not so stable as you think and in some stars is the fuel for thermonuclear fusion reactions to give deuterium, tritium, helium etc. On the other hand fission reactions produce tritium and other light nuclei. My view of atoms, hydrogen included, is a dynamic one: no nuclei surrounded by shells electrons but nuclei emitting and capturing back electrons. In the case of unstable nuclides electrons or positrons escape. In all mentioned cases a neutrino is emitted and this emission is not privilege of nuclear reactions and of radioactive nuclides but is a common feature to all nuclides. In this view even stable nuclides decay in the long times. 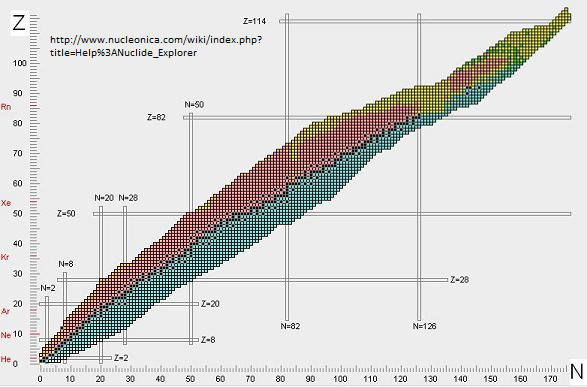 You can imagine my surprise, when fitting the nuclides chart with the Fermi model , to see how precise was the model. The neutrino flux per gram that I computed is almost an universal constant and can be used to derive the Newton Law starting from nuclear properties. Gravity is a nuclear fact. Now you can think to the big bang, to the black holes and to the dark matter and to the question marks and contradictions of modern physics in a different way?. I came upon this article trying to find a reference on the possibility of the existence of vibrational states of the deuteron. A rather frustrating effort for retied person with limited accessibility to scientific journals. However I have a question regarding this article. Fine, the energetics an quantum fluctuation in energy prevent the decay of deuteron, but is there a modern version of an exchange mechanism by which the identity of proton and neutron interchange via say mesons exchange (or of up and down quarks) that could also account for the stable deuteron nucleus, or is this hopelessly old and discarded false idea? My idea is that you will be frustrated if you have access to today scientific journals. Almost all papers deal with the BIG Bang, the Black Holes, the dark Matter and the Dark Energy in spite of the fact that Einstein refused to accept theese derivations from his theory. I suggest you to enter Academic Education whit my name for the last paper entiteled WHAT GRAVITY IS. Coming bach to your question, open the first article in italian entiteled Il LEGAME NUCLEARE E IL PESO DEL NEUTRINO and to the table ecounting nuclear bonds. If the energy of the nuclear bond is two anhilations and you compute thumber of bonds from the mass defect you will find that the number of bonds is equal to the non repated combinatins of protons an neutrons as Fermi suggests. Thanks for everything on this site Matt. I have one question. Why 15 minutes for a neutron to decay? It seems a strange time period, not extremely fast like many particles and not years like some atoms. Is there a standard model calculation or explanation? I’ve looked throughout the site and haven’t found the explanation. It’s simple, really. Just like neutrons obey Wolfgang Pauli when inside the atom, so they obey Andy Warhol when they’re outside of it. Once their 15 minutes of fame are up, it’s all over for them. I love this answer! The real answer is that it has to do with the fact that the proton mass and neutron mass are so similar. When the parent particle’s rest mass and the “children” particles total rest mass are almost the same, the decay rate is very suppressed. So you have to do a real calculation of the details to find out the answer. Similar issues explain why many radioactive nuclei have half-lives of years or millions of years.